Little by little, the regional government has sold off some of the buildings; some have been converted into student housing and a youth hostel. At the same time, serious structural problems have emerged, revealing the poor quality of the buildings: as a consequence, no-one wants to invest in them. The potential for regenerating the deprived Lingotto area has been squandered. Four buildings were sold off to a private holding (35% owned by the city, the rest by Pirelli and the Intesa San Paolo bank) and left empty for seven years. Even though no official investigation has been carried out, many claim that the Mafia was involved in the construction work (as has been proved the case in many other public tenders for public housing and private buildings). Many believe that quick and shoddy building for money laundering purposes is the reason for structural and other problems (the concrete is breaking up, the solar panels have never worked, countless minor pieces of heating insulation and pipework were never finished, and the paint is peeling off). In the meantime, between 2011 and 2013, a steady stream of refugees continued to arrive in Italy. These asylum seekers were able to benefit from theENA (North Africa Emergency Plan), an Italian government comprehensive integration project to tackle the humanitarian crisis following the turmoil in North Africa and the war in Libya. While actively supporting the Libyan war, the Italian government was unable to host the 30,000 ENA refugees properly. This programme reinforced the SPRAR project (Services for the Protection of Asylum Seekers and Refugees), providing funds to support the refugees’ insertion into training placements and the labour market as well as providing access to public healthcare and to dignified shelter. These projects were lacking in many ways: they failed to teach Italian, many were set in distant locations, no social integration or any understanding of Italian bureaucracy was provided, and job training just did not take place. Some locations were simply hotels or other facilities where the refugees were forced to stay with nothing to do. The ENA ended abruptly and in March 2013 many refugees ended up on the street. Some refugees were in contact with local squatters and housing rights activists. Together, they decided to occupy the ExMoi buildings in the former Olympic Village and on 30 March 2013 about 300 refugees took part in the action. Currently around 800 people of over 26 different nationalities live at the ExMoi, in four different buildings. This is the largest, most stable and important occupation by and for refugees that has ever taken place in Italy. On 23 May 2014 UNHCR reported that “thousands of refugees are forced to live in empty buildings in the main Italian cities like Rome, Milan and Turin, due to the lack and insufficiency of the projects.” The ExMoi is a prime example of this. The Refugees and Migrants Solidarity Committee is a group of volunteers which includes students, migrants, committed citizens and social activists. 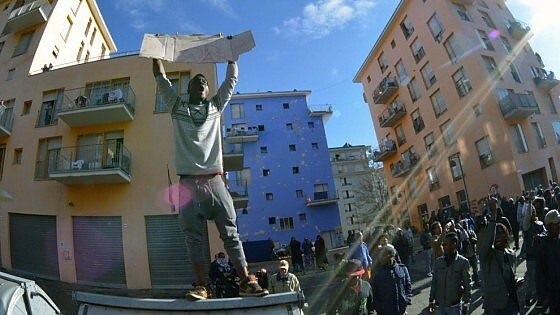 It is linked politically to two autonomist squats in the city, CSOAs Askatasuna and Gabrio, is also supported by various local associations and the local church, and is connected to the national grassroots housing movement. The Committee has been supporting the ExMoi occupation with the aim of providing refugees with housing after they were abandoned by the government. Since the occupation, the Committee has provided medical, language and legal care, created a school on the premises, and co-ordinated the distribution of food, furniture and other basic supplies. This is a significant development but not without precedent in Turin. Refugees were squatting in the city long before the ExMoi occupation. The movement started in 2007 with refugees from Darfur and there are currently at least eight occupied buildings for refugees (among 27 with other housing or political aims). Together, these buildings are home to more than 1,000 people. An eight-month-long political battle, begun by refugees and the Committee, has included various demonstrations and temporary blockades of public offices in order to get legal permanent residency (Residenza) for the refugees. Permanent residency grants access to all social and health services, and (for children) to school. It is necessary to renew the Permesso di soggiorno (permission to stay) which all refugees require in order to stay in Italy. It allow refugees to have a driving licence and legal job contracts. At long last, the Turin municipality granted all refugees permanent residency which gives them access to public healthcare and allows them to sign up with the employment agency. It does not, though, grant access to social services (which is discriminatory, according to Italian legislation). In early 2014 the Committee supported another occupation. A five-storey building was occupied, following the overcrowding of the ExMoi building complex. It currently hosts around 60 people. The internal yard has been converted into a vegetable garden run by the residents, and there is also a self-managed bike repair workshop. Formerly a nursing home managed by the local Catholic parish, today the building is managed by its residents, who take most decisions via a weekly assembly/meeting. Ownership remains in the hands of the Church, however, which has decided to form a refugee project in order to legalise the building’s status. Meanwhile the ExMoi occupation lives on. Many among the refugees are families (15% of the inhabitants are women and more than 30 children under 10 live there), some have found jobs and continue living there to support their friends. Many people have not been able to find a proper job but survive by selling metal or other materials found in rubbish bins. A community has somehow been created, with a mix of ethnic groups living peacefully together. Although there have been some minor personal clashes, life goes on, even if the structural problems make everyday living challenging: water pours from some ceilings, the electricity system cuts out, and only half of the apartments have hot water, not to mention the lack of any heating system. Despite all this, the refugees and the Committee have managed to keep ExMoi clean and working, repairing the worst problems in three out of four buildings. Unfortunately, a wave of racist reaction from the usual suspects (Lega Nord, Fratelli d’Italia and Forza Italia) has managed to destabilise the situation. These parties have joined together to create a political campaign with the aim of forcing the municipality to evict the residents, who they call “criminals” and “illegal immigrants”. Through contacts in the Turin municipality, they arranged an “institutional visit to check the situation”. Following negotiation with ExMoi, this was cancelled but a right-wing politician decided to come anyway, before being shown the door by the refugees. The far-right groups then held a racist demonstration in the area in December 2013, attended by around 50 people, mostly from Gioventù Nazionale, the youth wing of Fratelli d’Italia. They have now invited the head of Lega Nord, Matteo Salvini, well known for his racist statements and his hatred of social movements and immigrants. Thankfully, nothing has come of this. So far. Finally, in December 2014, a judge signed an authorisation order to evict the residents. It usually takes a long time for an order to lead to an actual eviction but the news made the papers immediately and right-wing parties are exerting pressure for an eviction to take place. It is highly unlikely that the municipality will use the police to evict the refugees, although this has happened in other places. In this case, both police and judges would like a peaceful solution, especially because of the large number of residents involved. It seems that the Mayor of Turin (Fassino, Democratic Party) will ask the national government for exceptional funding. The Mayor is also the president of ANCI, the association of Italian local councils, and has a direct channel to the prime minister, Matteo Renzi. This situation could have serious repercussions for Renzi and the PD. The experience of the 2007 Darfur refugees indicates how the institutions are likely to act: ask for funding, offer a legal temporary solution to those who accept, force out those who do not comply. It is worth mentioning that the police are both the authority that has to perform the eviction and acquire all possible information to perform it, and also the authority in charge of renewing the visas the refugees need (most of those living at ExMoi have humanitarian one-year visas, which are very hard to renew). The solution offered by the local government is quite clear: get millions of euros from national government, perform the eviction by any means, give the money to a well known association already handling refugee projects, give the association some breathing space with the funds, let the projects run for three to 12 months and then, once the money has run out and the story is no longer newsworthy, kick the refugees out again. In the end, money comes and goes, not into new solutions but into this well-established system, a system which is certainly not improving matters for refugees. The existence of ExMoi is testament to that. The process will take some time to work through, due to the large size of ExMoi. Meanwhile, the right-wing parties will have an easy target for the next elections and will keep on pushing for the harshest punitive measures. The refugees and the supporting Committee know this, and most are willing to stay and resist. In the months approaching the second anniversary of the occupation the refugees will have to weigh up the offer, if there is one, and make a very difficult decision. This entry was posted in Activism, Anti-racism, Commons, [en] and tagged exMOI, north africa, Northern League, refugees, Turin. Bookmark the permalink.